Store in a cool, dry place. Keep away from direct sunlight. Do not expose to heat. As research into medical cannabis expands, an ever-increasing list of ways CBD can restore good health are being discovered. The development of CBD topical balms means there’s now a way to treat skin conditions directly for faster and more effective relief. Each of these conditions manifests specific symptoms, but all result in varying levels of discomfort that include itching, tightness, scales, irritability, sleep and appetite disruption, infections and pain. 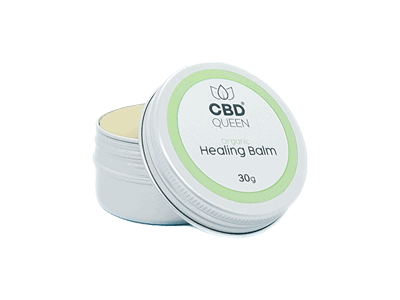 CBD Queen Healing Balm can offer fast relief from these symptoms by helping repair damaged skin. Users have reported significant improvements after just one week of use. Research shows that CBD has strong analgesic, anti-inflammatory and antiseptic properties when applied directly to the skin. CBD’s sterilizing properties protect the area while promoting skin cell growth, and even desensitizing your body to pain.